Good morning dearest Kitty! Oh, how delicious your baked pumpkin oatmeal looks...and sounds! I will definitely have to make this come Autumn...yum! 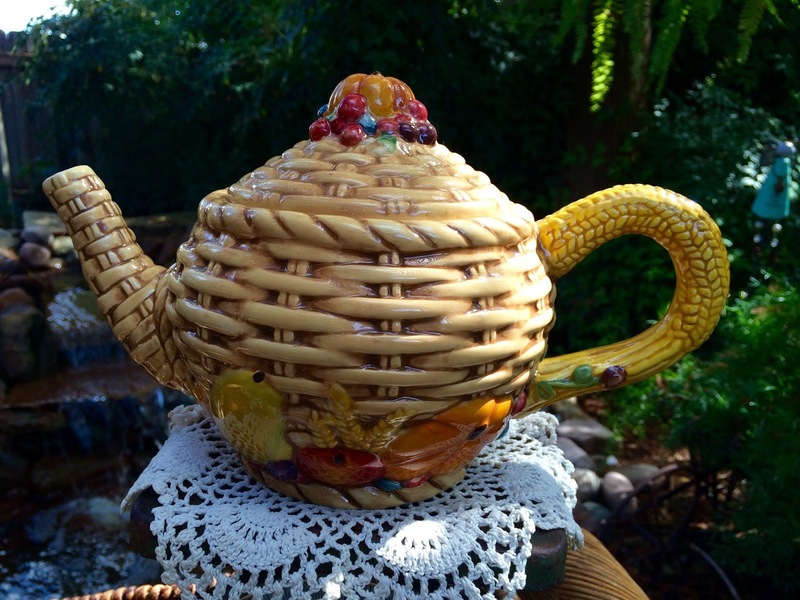 And how sweet it your tea pot...I have never seen anything quite like it! Wishing you a wonderfully blessed week, dear Kitty! How lovely to visit with you once again! Big hugs! I am so glad you liked it! I love your son's style of putting ice cream on it! I am a little jealous of you getting to have it outside by the waterfall. I hope you have a great week! Hi Kitty, What a cozy fall day post. 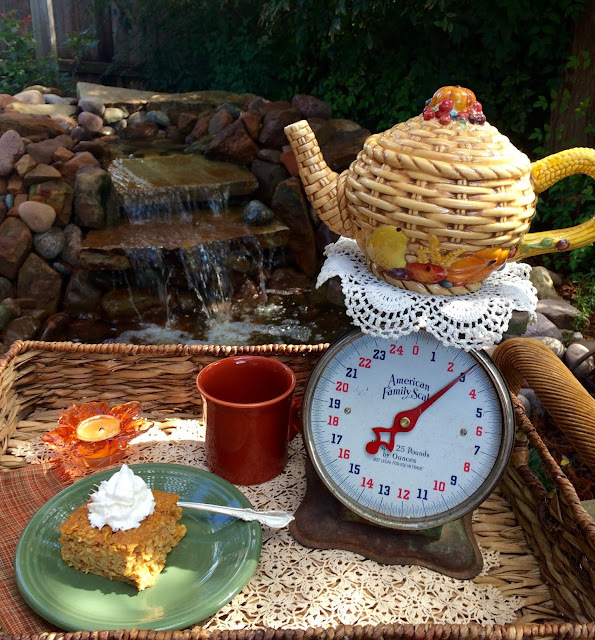 I would love to be sitting there with you enjoying this lovely tea and the baked pumpkin oatmeal. This sounds so good and thank you for sharing the recipe from your friend. I adore the tea pot too. Such a pretty basket pattern. I love the scale you are using in your photo. You received beautiful gifts from dear ladies and they are perfect for you. Hi again, forgot to say, I love your blog header!! Darling tea pot! The recipe sounds very hearty and good. You can't go wrong using real maple syrup. Lovely pumpkin! Your teapot is so cute! We wouldn't dare sit outside...to wet and cold. Thanks for linking to Tuesday Cuppa Tea! Your teapot really is cute, Kitty! I couldn't help but think about my father when you mentioned having your eggs and melted cheese for breakfast. My mother used to make him an egg and melted cheese every morning. We kids weren't allowed to have the cheese because it was for him only. The pumpkin oatmeal sounds delicious too. Our weather has turned quite chilly so no more sitting outside for me. Thank you for sharing with us today and enjoy your wonderful gifts. Such thoughtful ladies! Baked pumpkin oatmeal sounds so good. My mouth is watering. I bet you love mail call!!!! Lovely goodies you received. I love embroidery and of course, tea! Fun little Autumn teapot. Oh, I love that tea towel!!! Embroidering tea towels is one of my favorite things to do. And the pumpkin oatmeal looks wonderful. I will have to try this recipe. Thanks for sharing it. Oh -- and the teapot is pretty, too. I have never seen one like it. Your tea towel is adorable, Kitty! My grandma used to do embroidery. Your pumpkin oatmeal looks great! Love your waterfall too. We took the pump out of our water feature so it's just a quiet pond now...had to do that before winter. Our weather has been really nice so far, and I'm thankful for that. Have a good week, Kitty! That's such a cute tea towel embroidery. Sweet gift from a blogging friend. The pumpkin oatmeal sounds delicious and hearty for a fall breakfast. Enjoy that good weather while it lasts! Baked pumpkin oatmeal sounds like just what the doctor ordered! With a bit of whipped cream on top! Hooray for sweet blog friends! What a super cute teapot and tea towel! So glad that you enjoyed the David's Tea samples. Hi Kitty, wow I love how you used this recipe from Carlee! It looks so good. I will have to give it a try. This baked oatmeal sounds delicious Kitty,. I just need to swap out a couple of ingredients to adhere to my plan and I think I will enjoy this very much. Very nice gifts, too. The chocolate tea sounds so interesting. Oh, I love that tea towel. Judith sent me a similar one as part of Stephanie's teacup exchange. The baked oatmeal sounds delicious, perfect for this time of year. I thought that was a twisted corn on the cob at first on your tea pot! haha wheat makes so much more sense. A lovely autumnal tea tray Kitty and your cake looks delicious. Everything you bake looks delicious and you know I've made many of your recipes. I'm glad you like the treats I sent you and those from friend Margie as well. Enjoy! Hi Kitty! That teapot is wonderful and it looks like you scored some great treats :). Thanks so much for stopping by my blog and leaving a comment--I really appreciate it, especially since I haven't been around much lately. I love your little teapot...and the pumpkin oatmeal sounds heavenly....a must try for sure. That looks delcious, and that little teapot is so cute! Hope all is well with you! What an adorable teapot Kitty! 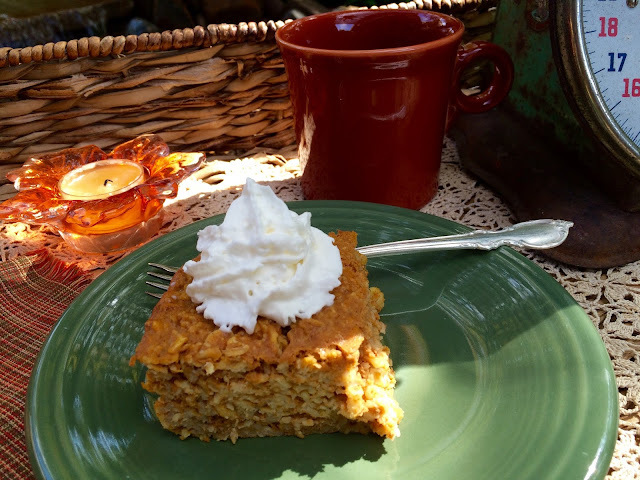 I think pumpkin and oats is a perfect pairing and I love that it bakes and serves like a cake! Kitty, the teapot certainly is darling! Beauty before function, for me sometimes. Hee-hee! Love the tea towel. What sweet friends! The baked oatmeal sounds yummy. Thanks for sharing the recipe with SYC. Love the towel and the teapot. SO nice to be remembered by thoughtful friends! Cheers! The teapot is adorable. I had one like that years ago and sold it and now looking at yours I sure wish I hadn't.....but again, a gal's gotta do..............lol. Judith and Margie are AWESOME wonderful Canadian ladies whom I adore, too. Your gifts from them are so perfect, and couldn't have gone to a sweeter recipient. Margie I have gotten to know through the recent tea cup swap - and Judith is a long-time blogger sister. ♥♥♥ Hugs to you! This looks totally yum! I think my kids will enjoy this while home from college over winter break. Thanks for a great-looking recipe! Love love love it! Thanks for sharing with us at Weekend Potluck. Hi Kitty, such a great little recipe, new to me. 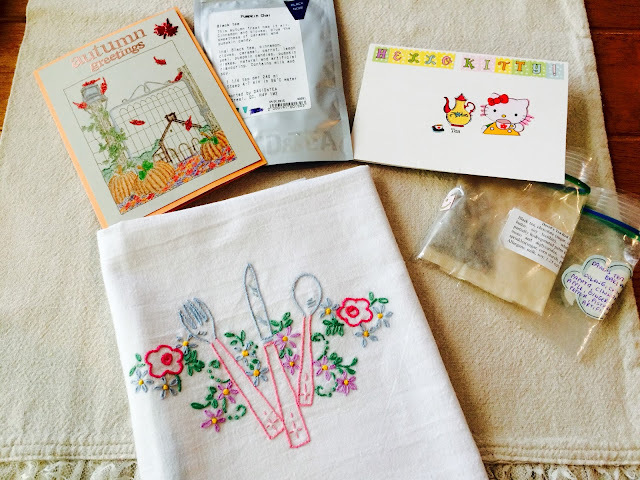 Very sweet of your fellow blogging sisters to send tea, a pretty tea towel and card. Happy Sunday. 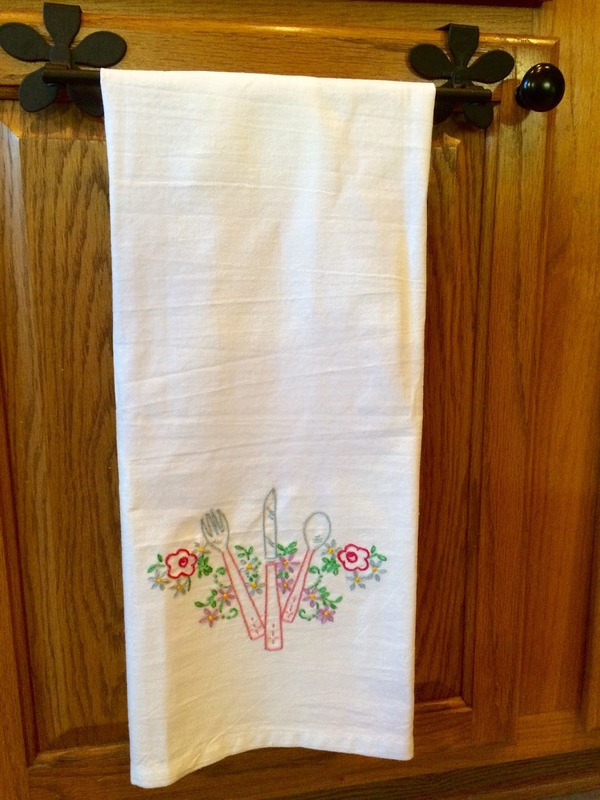 What a lovely tea towel and nice needle work. Your Baked Pumpkin Oatmeal looks delicious.Your recipe is awesome, I have pinned it. We really enjoy you sharing with Full Plate Thursday and hope to see you again soon!